What could be better than a game that allows you to build whatever you want and undertake tense adventures in an adorable fantasy realm? A portable version. Terraria arrived on the PlayStation Network and Xbox Live Arcade earlier this week, and while it still isn't receiving the same kind of mass praise as Minecraft, it's difficult to find a more engaging title on any platform. 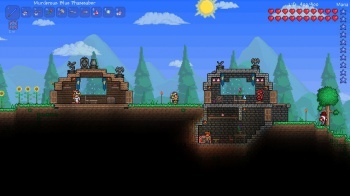 505 Games, the publisher responsible for bringing Terraria to home consoles, is well aware of how addictive and engaging its game can be, and has decided that the only way to enhance Terraria's time-sucking potential is by offering fans an iteration of the game that can be toted around in one's pocket. Thus, the company has revealed plans to bring the game to Sony's Vita handheld this summer. "We're all huge fans of Terraria and have been overwhelmed by the support we've received from the existing community since we began working with the property," writes 505 Games senior global brand manager Tim Woodley. "[It's] been amazing to see how many of those fans have been asking for a portable version of Terraria so they can take their adventures with them on the go." "The biggest challenge for us is how to give players the control they need to fully enjoy [Terraria] and we're really excited to explore the potential of the multiple input options that the PlayStation Vita affords us." While the transition from Terraria's native PC platform to the PS3 and Xbox 360 was handled quite well, the Vita adds a new wrinkle to the title's potential control scheme: Specifically, touch screen controls. Though Woodley offered no specifics on how Terraria might function on the Vita, he claims that "the touch screen will ensure a totally unique experience." What exactly this means is anyone's guess, but those who've been enjoying the Xbox 360 and PS3 incarnations of Terraria should be well aware of the potential the touch screen presents. In the console titles, minute, detailed interactions with the world are accomplished by clicking the right stick to enter a free cursor mode. This is perfectly serviceable and works quite well once you get a handle on things, but it's easy to imagine that the touch screen would provide a more accurate analogue for the keyboard and mouse control scheme that Terraria was initially designed around. Or 505 Games and developer Re-Logic might take a completely unexpected route and bind something utterly wacky to the touch screen. Who needs an untethered cursor when you can aim arrows by tapping the nearest zombie, or gather gold ore by tapping a shiny rock until your fingers are raw and bleeding? Expect more specific details on the Vita version of Terraria very soon. Summer is almost upon us, and given Terraria's miniscule size - the Xbox 360 game is a mere 33MB download - it can't that take long to rejigger the title for its Vita debut.